i haven’t blogged these before because they barely rested in my hands long enough to be wrapped up before they were gone. a present for M’s friend, they were finished very much at the last possible moment, so unfortunately i don’t have a decent picture of them. 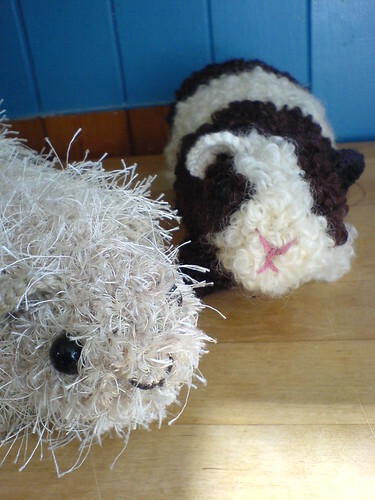 the process was fun and educational and only a little frustrating :) M came up with the idea to make guinea pigs and i figured there must be a crochet pattern out there somewhere. i didn’t realise at the time that the pattern had only been published a few days before. i found june’s tips for working with fuzzy yarn absolutely invaluable - i wouldn’t have attempted the pattern otherwise. that said, it wasn’t a complete walk in the park. 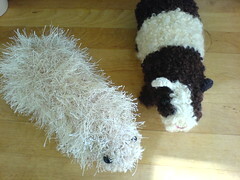 the eyelash yarn (the lighter, fluffy pig) was easy enough to work, but the boucle (2-colour short-haired pig) really wasn’t. i ended up running a companion thread in a contrasting colour alongside, so that i could keep track of the stitches. i don’t recall the process totally but i seem to remember the legs being a bit of a pita. still, i’m reasonably happy with the results, once again yay for making things for five year olds. i don’t know much about guinea pigs but i think these are a pretty good likeness, although the eyes are definitely too far forward on the lighter pig.